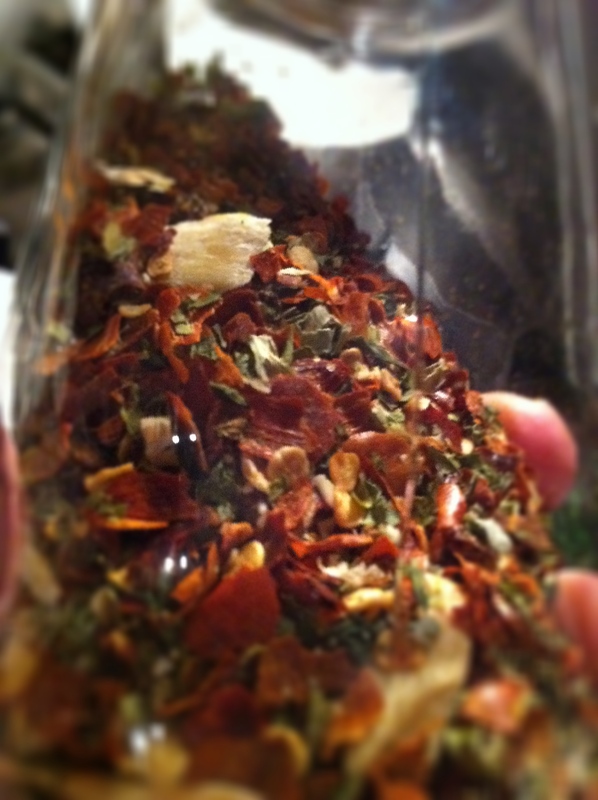 This is the A.O.P - a heady mix of dried herbs, dried garlic and peperoncino flakes. Mr Monster: So our good friend Simon came down to stay and play video games a couple of weekends ago. Mr Monster: He brought with him a great Italian cooking secret that we didn’t know about called A.O.P. It’s based around a trinity of Aglio (garlic), Olio (olive oil) and Peperoncino (chili pepper) and comes in a little jar with mixed herbs, mainly dried garlic, sweet red chili flakes and parsley. 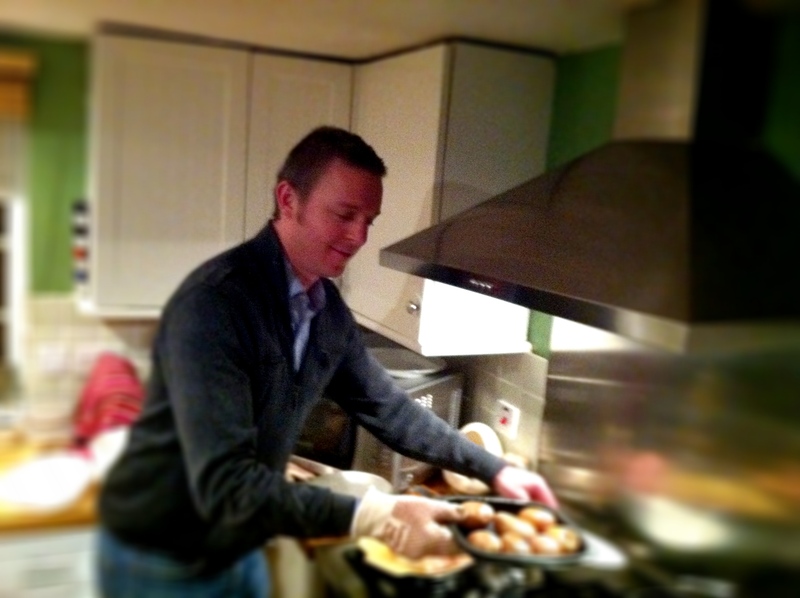 Here’s Simon cooking our supper and his recipe for baked cod, which he served with roasted vegetables and sautéed spinach with A.O.P, is below. ... and finally, to THIS... yum. 2 large bags of baby leaf spinach. 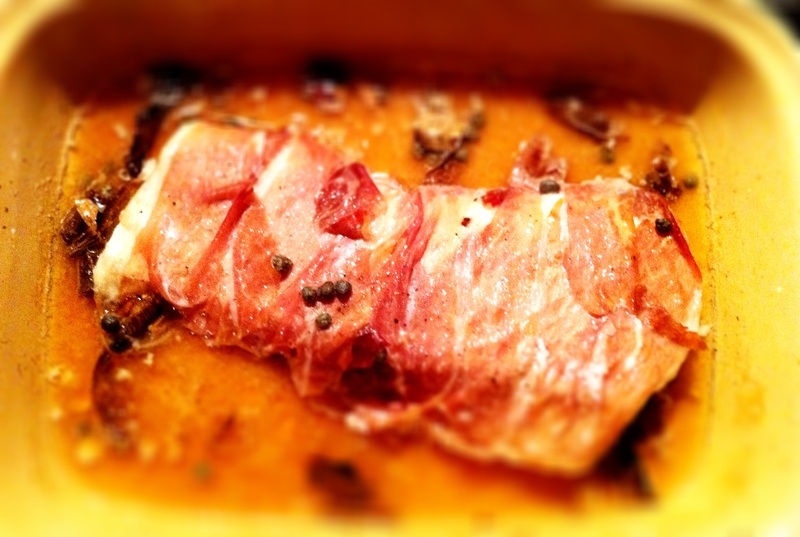 Preheat for oven to 180 degrees (celsius). First prepare your vegetables. 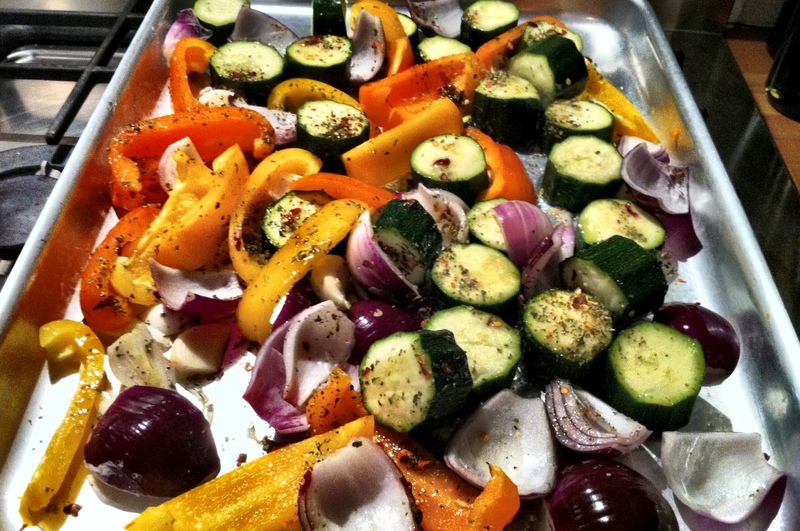 On a baking tray, put your chopped vegetables and mix in the olive oil, spices and herbs. 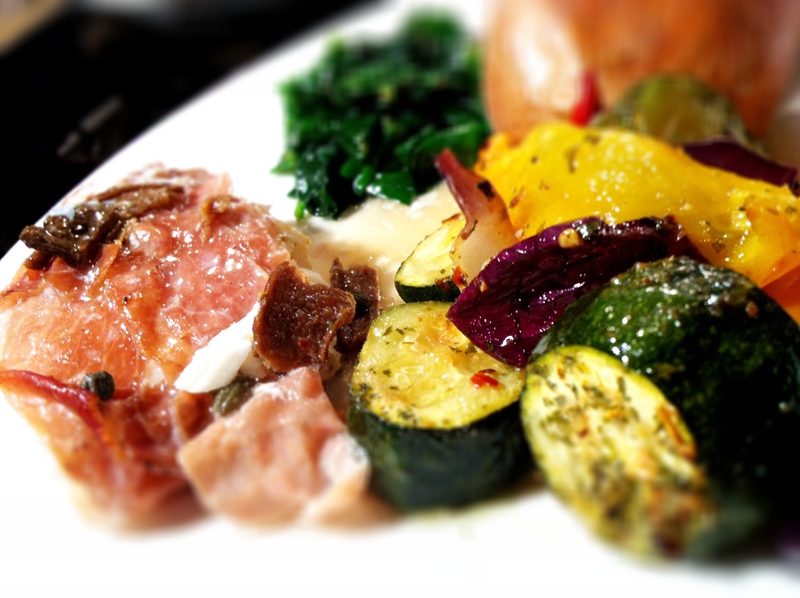 Place your roasted vegetables on the top rack in the oven, leaving room below it for your fish. Pop your vegetables into the oven and bake for about 40-45 minutes, tossing the vegetables 1-2 times during the roasting. 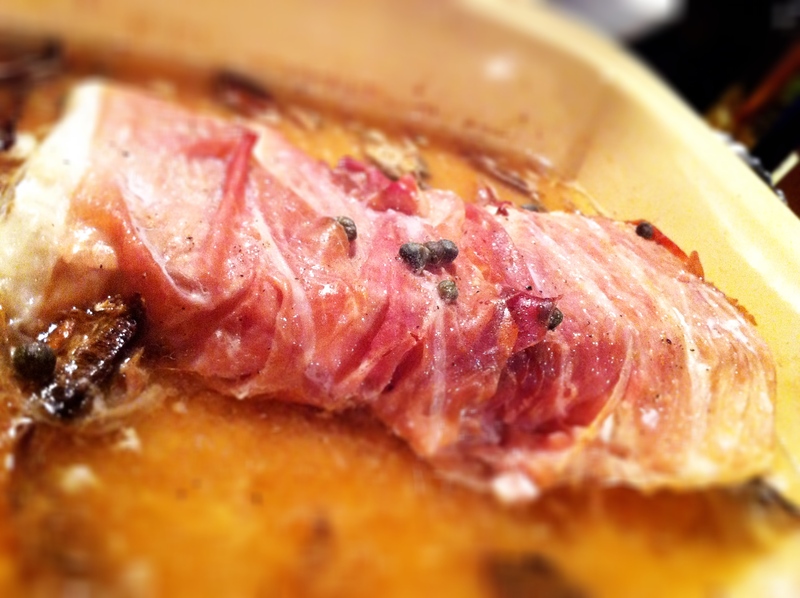 Wrap your cod fillet in parma ham, and place it in a baking dish. 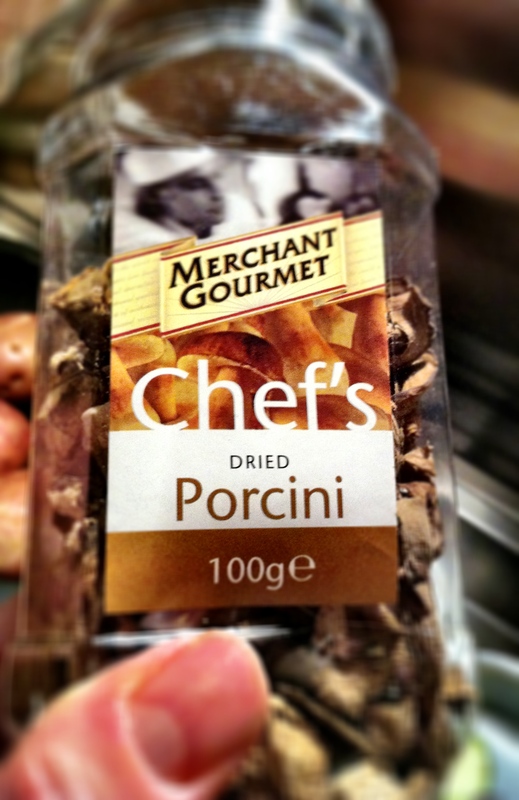 Scatter the capers and dried porcini mushrooms all around the dish. 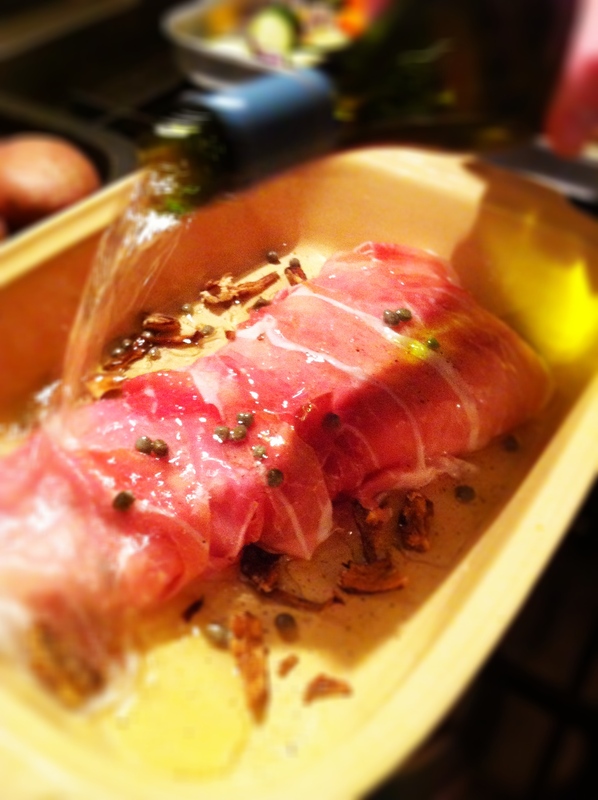 Drizzle some olive oil over the wrapped fish and pour the wine over the fish and around the baking dish. Cook the cod in oven for about 15-20 minutes. 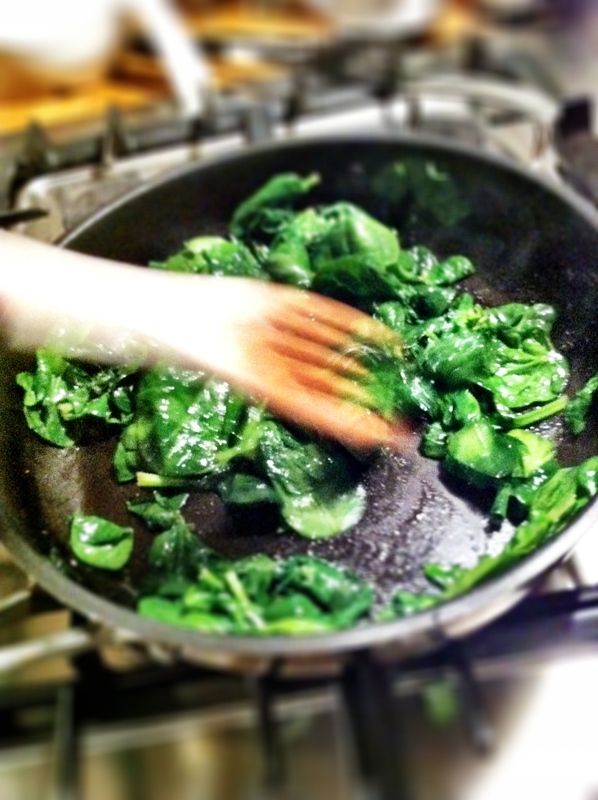 To saute your spinach, heat your oil in a sauce pan, pop your washed spinach leaves into the pan and put the lid on. Sweat this for 1 minute and then add your A.O.P. Turn off the flame as your spinach should already have wilted down by now but remain a rich, dark green. 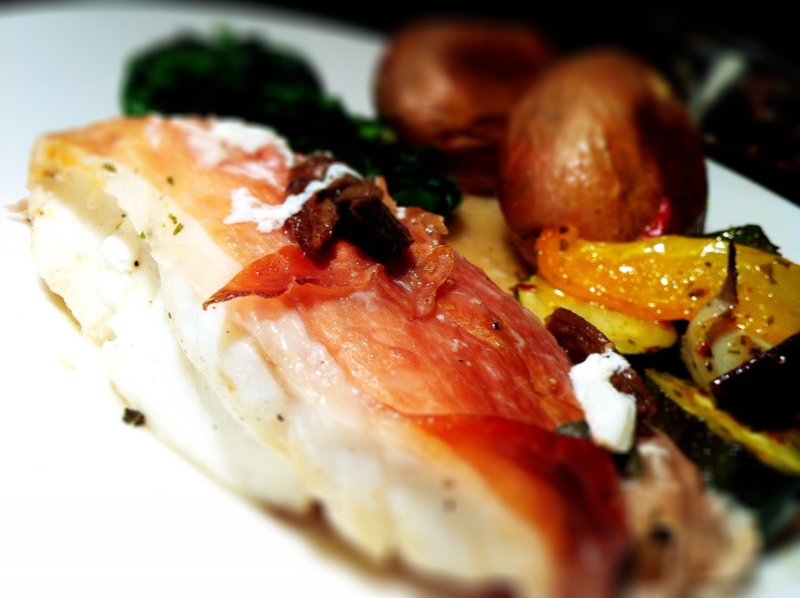 Serve your baked cod with the roasted vegetables and sautéed spinach, and spoon that lovely syrupy wine juice with the porcini mushrooms all over your fish. Ohh yum yum yum, can your friend visit me? That fish looks amazing. Sounds like AOP is going to be a new acronym used frequently in your home. Oh wow! Your friend Simon looks so much like a Simon I knew many years ago working for the YMCA! LOL. I’ve passed on your comments to him. Maybe he is your ex-colleague?!? What a coincidence that would be. wow..I wish I was invited to that dinner!! Simply amazing, what an abundance of flavor!! Gotta try this one for sure! I have to make some new friends! That cod looks amazing and is something I’m going to make the next time I purchase a nice cod fillet. I’m, also, going to look for A.O.P. but I think it would be easier for me to make some. I’m somewhat familiar with my markets’ inventories of Italian herbs & seasonings and this isn’t one that I’ve seen. Still, I’ll be looking for it. Thanks for the tip. yes the components are all easy to make yourself if you can be bothered, there’s lot of dried parsley, dried garlic and big slices of perencino chilli. Simon took his spice jar home with him (boohoohoo) but we’ll pick some up the next time we visit the shop he goes to in London. 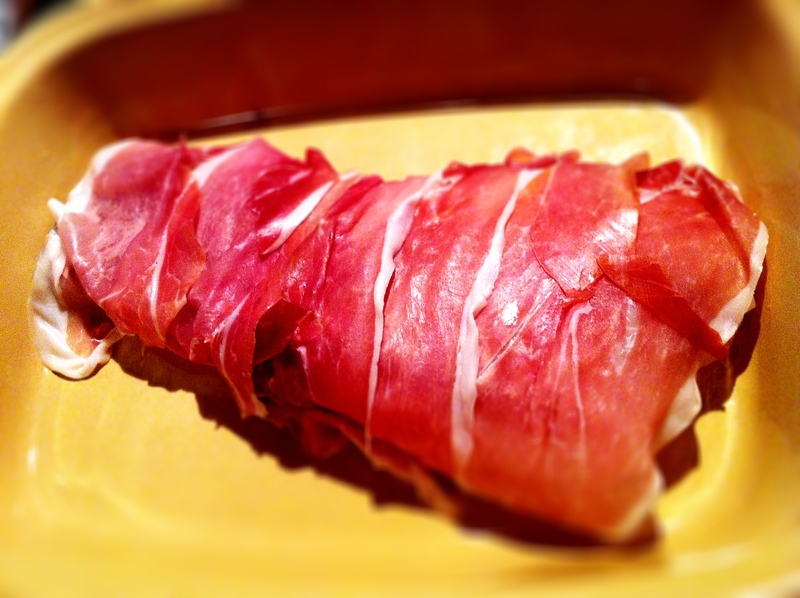 I love anything wrapped in parma ham. Your dish looks amazing! Hahaha, couldn’t agree with you more! Wow, Bravo!!! This is spectacular, definitely a restaurant quality dish! I’ll make sure I pass on your comments to our friend. Am sure he’ll be very chuffed. Wow – that looks amazing! I’m a sucker for good fish fillets like that. I’m sure it was amazingly delicious! It so was. We can’t wait to make this again too, once we get hold of some more AOP. Looks wonderful! I love parma, especially baked!!! Baking it with the fish and in white wine was awesome, the saltiness leeched out of the parma ham but into the sauce – it was lovely! YUMMY:) Thanks for sharing & Have a Great Day! Wow, lucky you to have such a good friend to cook for you, even if he’s just playing video games all night. I’ll have to bookmark the recipe—we’re always looking for something new to make with fish…our favourite right now is halibut. Halibut’s lovely. We don’t buy it too often as it’s quite expensive. So is cod but this was a special treat. 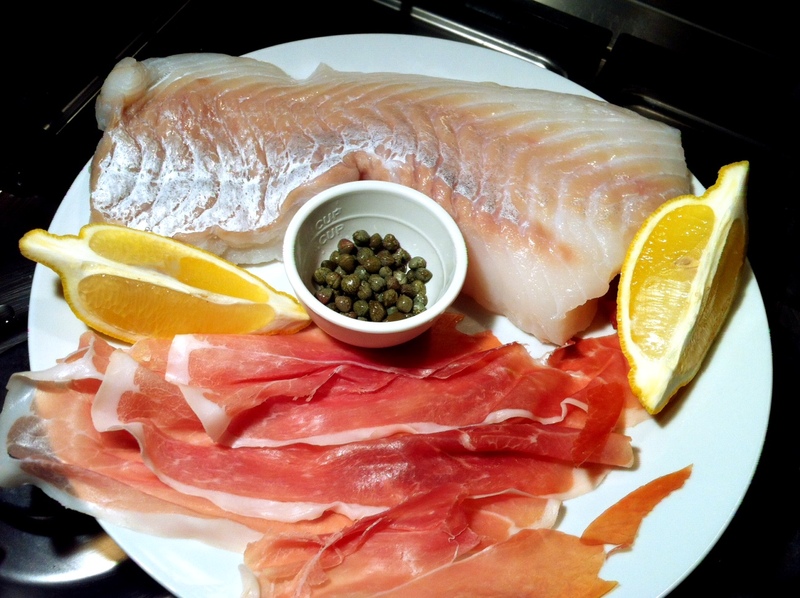 We normally eat a lot of tilapia and I love oily fish like salmon, tuna, etc. Sadly my husband doesn’t really. We didn’t speak much when we were eating either, LOL!